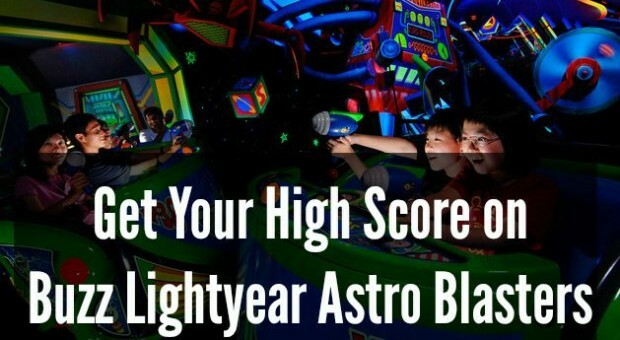 Have you ever ridden the Buzz Lightyear shooting rides at any of the Disney theme parks? Today we will share the secrets on how to get a much higher score on the attraction. Use these tips to amaze your friends with your high scores and blow their scores out of the water. 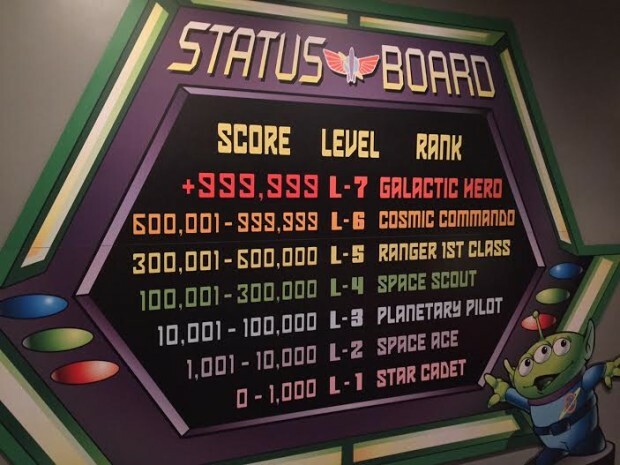 You may even make it onto the high score board located at the exit of the attraction. Are we missing any top tips for getting the high score on Buzz Lightyear Astro Blasters in Disneyland? Please share them and share this article. Each of the targets in the attraction are worth different amounts depending on their shape and whether they are lit or unlit. See our next tip, so that you really can get the high score. When the lights are lit they are worth 10x the point values listed above for the first person to hit it. Previously the lit targets were connected to an online game themed to Buzz Lightyear. But the game has been taken down, and now the targets are lit randomly. If you really want to get serious about your next visit, take a look at the video of the attraction and plan out the best path through the attraction. No, I don’t mean go to the parks alone. Just, get your own vehicle when you are boarding the attraction. Right when your guns are activated, test the accuracy by firing at the wall. Most times the guns are pretty accurate, but occasionally you will want to switch to the second gun in the vehicle. Also, when I do ride with another person, I find that we argue over who gets to drive. Generally, the left side gun is much better situated to achieve the highest score possible. This is another reason to ride in your own vehicle. Once you discover a target, make sure to fire repeatedly. The target values are worth the same amount every time and you don’t waste time refocusing. Each of the guns has a flashing red light scope that goes every second. The lights of other shooters’ guns can be quite distracting when you are looking for your own. The lights on the second gun in your car will still go off, even if no one is firing the gun. To reduce the level of distraction, place the other gun from your car not being used on the seat. The ride stops frequently in order to load people who are disable or to retrieve something that someone left in a vehicle. When the ride stops, your gun is still active. This is the time to rack up the points. My highest scores have always come from times when the ride has been stopped. Jokingly called the “better luck next time bonus,” you receive 100 points for every five times that you fire and miss a target. Just keep on firing and you will continue to accumulate points even if you don’t hit the target. The most important thing is to have intention while shooting. In almost every room there is a valuable target hidden in plain site. Below see our list of the locations of the valuable triangle targets. Backside of the robot’s hand in the first room. Behind the moving saw blade of the spaceship in the first room. In the alien planet room, find the triangles on the back of the circle of moving aliens, right as you enter the room. 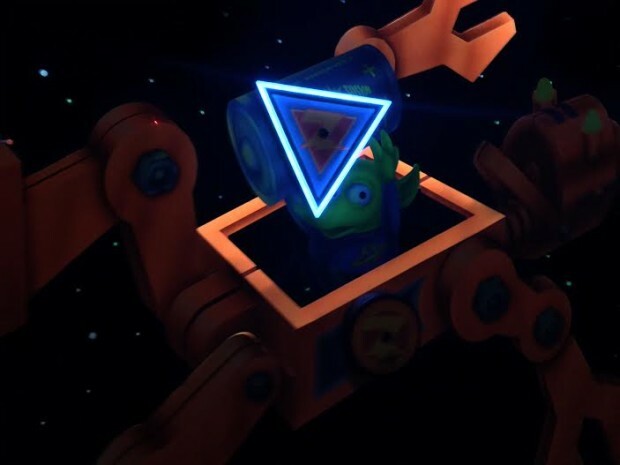 Shoot the target on the outside of the jack-in-the-box to open the box, then hit the triangle on the alien that pops out. On the walls of the dark starry tunnel, there are three hidden triangles that occasionally have lights glimmer across them. 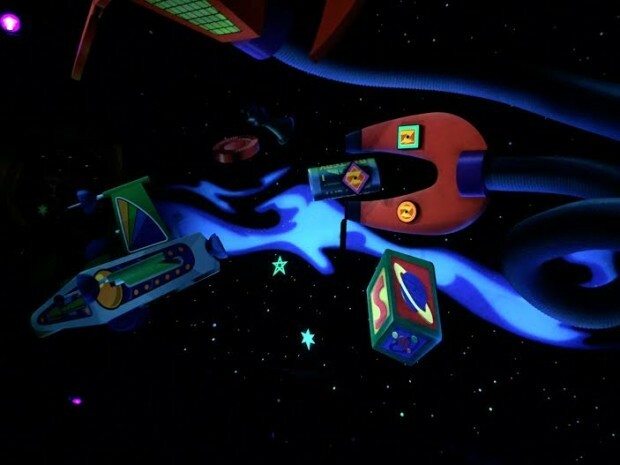 Inside of a box on the opposite side of the room from Zurg in the final scene. You must hit the circle to make the target pop out of the box. See tip #9 for the locations of the two most valuable targets in the attraction. This is the highest valued target in the attraction, worth 50,000 points. There is a tiny unmarked hole in the middle of Emperor Zurg’s chest armor in the first scene where he is featured and the last big scene where he is featured. When you enter the first room with Zurg, aim for the large green square on the bottom of his gun. The figure will turn towards the gun that has hit the square. At this point, switch over to shooting at the little hole on his chest worth 50,000 points. When you get an earth shattering score because you utilized the tips in this article, be sure register your score. After getting off the attraction, you can put in your name and email to be sent a copy of your score and a photo of yourself. Then, if your score is one of the highest of the hour or an all time high score, your initials will be featured on the scoreboard for all of the world to see. If your score says 999,999 on the ride vehicle, then you have maxed out the score screen. To see your real score, you must visit the kiosks at the exit of the attraction to see your full score underneath your photo. While scoring this high sounds impossible to most, myself included, the high scores for the attraction are over 7 million. Finally, take a look at the score value chart below. What is your current high score and what do you want your high score to be in the future? This attraction continues to be quite popular with the Disneyland community. 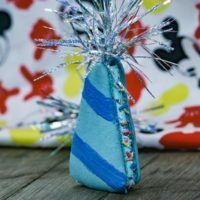 In fact, Disney Chief Creative Officer John Lasseter was recently seen racking up tons of points on Buzz Lightyear before attending the Disneyland Candlelight Processional. Even with the popularity, the line for the attraction moves quite quickly. Generally, we will not wait to ride the attraction unless the queue is shorter than 15-20 minutes long. 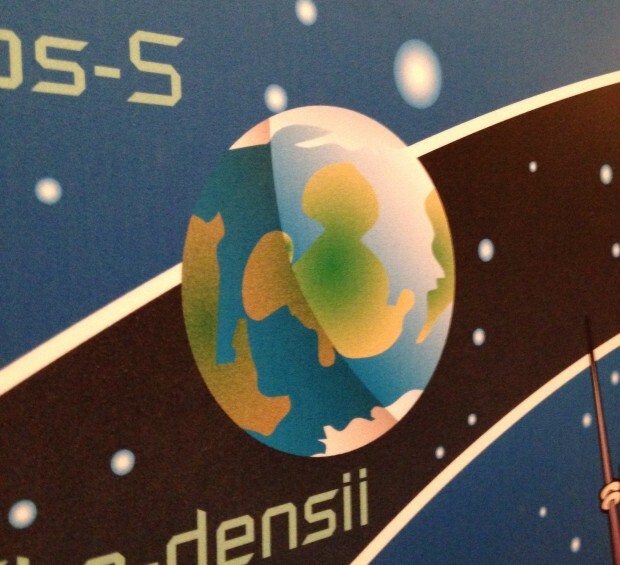 Just for fun, be on the look out for Hidden Mickeys in the attraction. Here’s a close up on a great one in the queue. Do you know where you can find this? 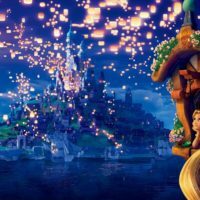 For more about Disneyland, join us on Facebook and on our newsletter. 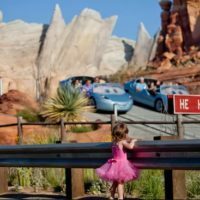 You need to check out our guide to Disneyland ticket discounts if you are headed to Disneyland any time soon. I saved more than $20 per ticket during our last trip. I love when it stops, I get a lot of points. Can’t wanit to go on it again! Has anyone here had a problem with getting an incredibly good score, and then having the emailed photo always give that score to your opponent? This is a common issue. I have seen it happen as well. My friend and I rode this. He beat me, but at the end when we went to email the photo his score was shows at zero haha ? I was able to get over 1,100,000+ pts in 11-2015. The ride stopped really close to emperor z. About 20 secs I suppose. Wow, I couldn’t believe my luck. L-7 Bragging rights forever. Thanks for the other tips, too. I can hardly wait for our trip June 2016 . Wow Greg, that’s incredible! Were you able to capture the picture with your score? I would love to share it. If you find a triangle target that is easy for you to shoot, spin the ride vehicle so you can face it as long as possible, even as you continue to ride past it. I was there this past December and hit 920,000+ I’ve got the pic posted on my IG account. It said I was officially ranked 36th!!!! That’s fantastic! So happy that the tips were able to help you. I’ve tried to hit the target on Zurg’s chest dozens of times but I’ve never hit it I’m questioning if it’s true or not can somebody give me video proof that it works Thanks! I was there last weekend, notched over 1 million points for both me and my 2 year old son 😀 got pics and little video after ride stopped for about 5 mins, so no idea on my ‘real’ score. Didn’t realise you could have it emailed or ranked. Nice tips btw.